Big Beat Tornado is available for weddings in the Reading, PA (Berks County) area and regionally. Take time for a funk break. Explore our links, learn about the band, listen to some music or best of all check out one of our upcoming shows. 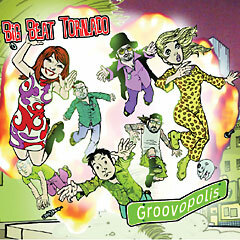 Big Beat Tornado's debut CD Groovopolis is available for purchase on our music page. Check out our MySpace site for music samples and more! Signup here to receive our periodic e-mail broadcasts. We'll let you know when and where you can catch BBT live!